The Archbishop of Canterbury has defended his occasionally outspoken interventions on issues such as the Iraq war and Sharia law. 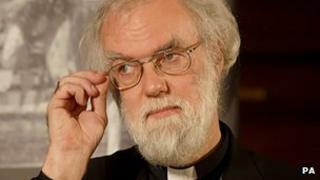 In one of his last public appearances before he retires after 10 years, Dr Rowan Williams told theological think tank Theos he had felt a duty to say what he believed was right. But the archbishop acknowledged that some of his judgements were "risky". And he admitted that there were times when he had spoken too hastily. Dr Williams said: "I just don't think that it will do to be too cautious in a job like this. You are here to try and say what you believe. "To try and share a particular picture of what the world is like, what God is like, which of course leads you into sometimes risky and anything but infallible judgements about particular issues of the day." In 2003, during a service of remembrance at St Paul's Cathedral for those who died in the Iraq war, Dr Williams said he had "grave reservations" about the morality of the conflict. And in 2008 he was widely criticised after he appeared to back the adoption of some aspects of Sharia law in the UK. Dr Williams admitted he had sometimes thought: "I shouldn't have said that." The archbishop retires at the end of the year - and the Crown Nominations Commission is considering who his replacement will be. During the session at Theos he acknowledged that the Church had made mistakes about homosexuality, and was still catching up with a new reality. But Dr Williams said being head of the Anglican Church had never been easy - and there was never a time when it was free from difficulties. He said: "There is no golden age in the Church's history. We may think, oh, it was relatively problem-free then - one of the advantages in this job of being a Church historian is that you know that is not true."